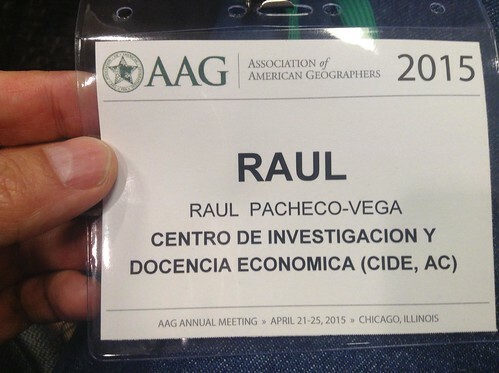 While I do a lot of spatial analysis, I follow a lot of human geographers on Twitter and I did a lot of economic geography in my doctoral dissertation, I hadn’t been to the Association of American Geographers (AAG). 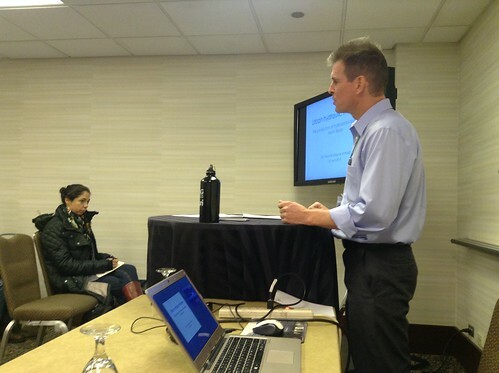 I had done a few Canadian Association of Geographers (CAG), and for the first time in my life, this year I’m doing both. 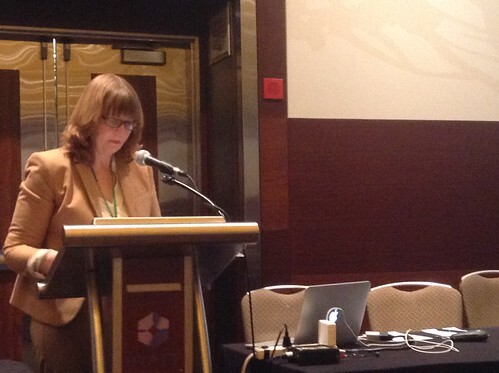 Well, I did AAG already (last week) and will be at CAG in early June 2015. This year, I decided to organize a couple of paper sessions with Oriol Mirosa (University of Wisconsin-Milwaukee) and Jeremy Schmidt (Dalhousie University, soon-to-be-at Carleton University). I’ve always loved Oriol and Jeremy’s work and it was a great experience to collaborate in this project. 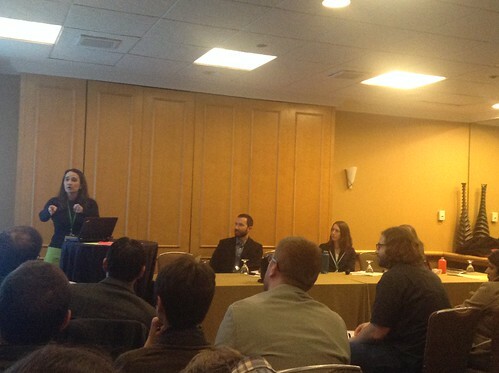 And after a really long week of conferencing, I'm ready to pass out for like, the next 3 weeks #AAG2015 it was worth every minute, though. 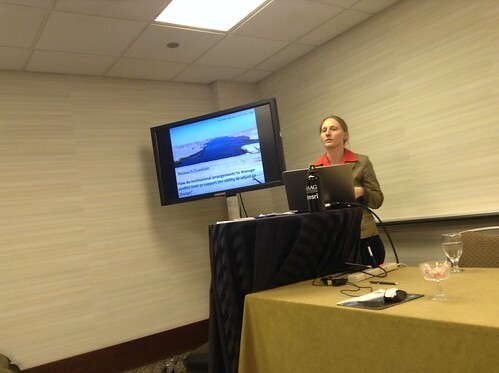 What can I say about my experience “at the AAG” (that’s how most geographers seemed to call it)? It was AMAZING. I have to note that I missed two of the biggest political science conferences (Midwest Political Science Association, MPSA and Western Political Science Association, WPSA) because they were way too close to AAG for me to spend 3-4 weeks conferencing. In many ways, I felt that I had made the wrong calculus because so many political scientists I wanted to meet were both at WPSA and MPSA. 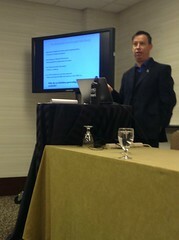 My experience at AAG was nothing short of outstanding. You have to understand, I was spending one week of my holidays (we are on holidays right now at my campus) in Chicago for a conference I had never been to, and while I do spatial analysis, my obvious slant towards public policy and political science is quite visible, both on my work and online. So I didn’t know how the geographers would react to my work. Happy to report that they reacted really well. I am positively impressed by the kindness with which human geographers conduct themselves while providing feedback to other presenters. Other academic learned societies could do well to follow their example. 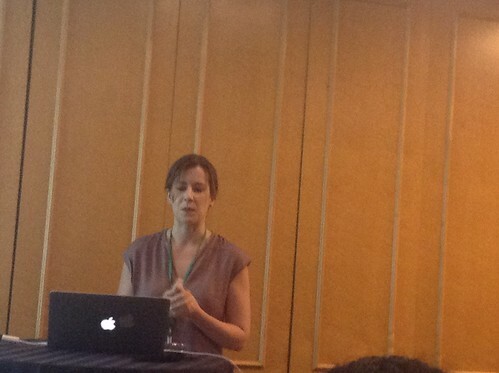 Jeremy, Oriol and myself organized two paper sessions around the topic of Fetishes of Water Governance. We wanted to critically interrogate the most relevant aspects of water governance issues that seem to be the object of affection (or shall we say, object of obsession?) of many social scientists. Why are we fixated on public participation? Why is the human right to water such an important construct, and is it feasible to implement? Why are we obsessed with data, and when is it enough? Our sessions, Fetishes of Water Governance I and Fetishes of Water Governance II achieved exactly that, and even though we were allocated in what I call “The Dumps” (the most intricate, hardest-to-find furthest room they could possibly find, and the last two sessions of the last day of the conference), we had an extraordinary audience that was willing to stay with us for the entire set of papers, which I found rewarding and helpful. 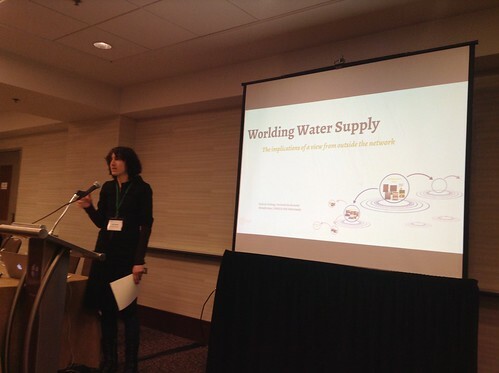 The discussant was Kathryn Furlong (Université de Montréal), a well-known scholar in urban water governance (and a very good friend of mine who was also a colleague in graduate school). 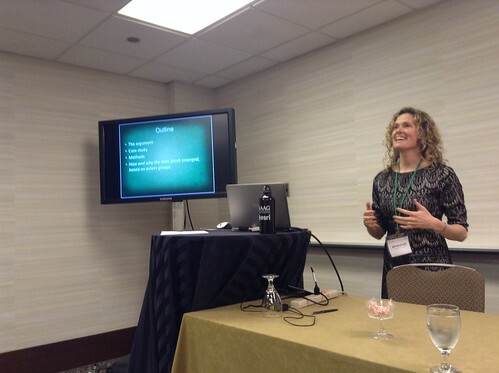 I felt really happy to have Kathryn discuss our papers because she really brought out some excellent comments on the reification of specific fetishes. 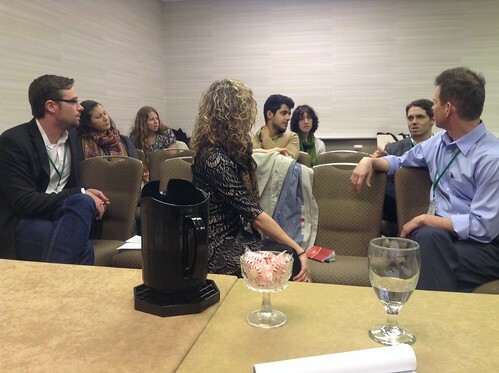 I look forward to what will come out of our sessions, most likely a special issue of a journal. 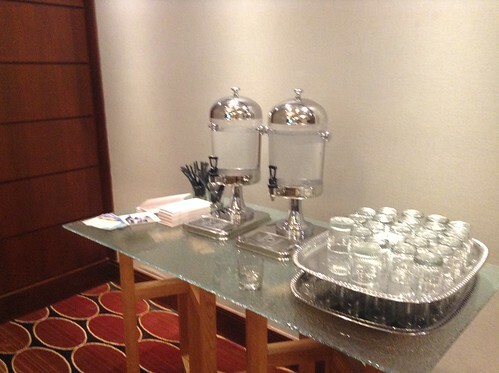 One thing I wanted to note was that every single host hotel (with the Hyatt Regency Chicago being the main coordinator and host, apparently) served water from the tap, and that there were abundant water bottle refilling stations throughout all the hotels. This is not a small feat to achieve and I wanted to note it, given my own research on bottled water and the marketization and commodification of water. Quite obviously, I attended a lot of the water sessions. 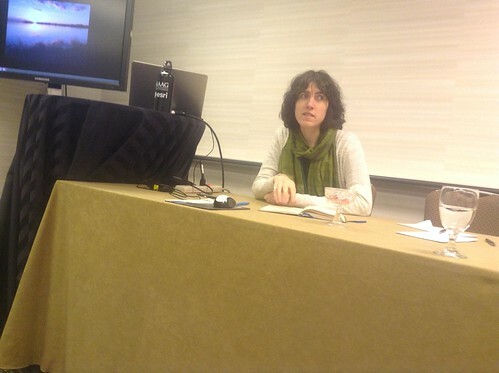 There were a number of urban geography and geographies of sexuality and economic geography sessions, but I concentrated on water as this is the field where I am most established and where I wanted to see my colleagues. Kathryn Furlong presented work she’s doing with Michelle Kooy on Worlding Water Supply. Rebecca Lave (Indiana University, at Bloomington, and someone I’ve slowly become friends with because we’ve seen each other so much in the last couple of years) is a critical physical geographer who studies political ecology and physical geography, particularly in riparian streams, and she did a fantastic presentation on stream mitigation banks, which seems to provide a similar alternative to that of carbon credits and tradeable permits. I also saw some preliminary work that Margaret Wilder (University of Arizona) is doing on desalination in the US-Mexico border with a number of colleagues, including my friend Nicolas Pineda Pablos. I also saw the work that Harriet Bulkeley, Mat Paterson, Matt Hoffmann, Sarah Burch, Patricia Romero Lankao and others are doing on pathways to decarbonisation and trigger/tipping points in climate governance in urban systems. 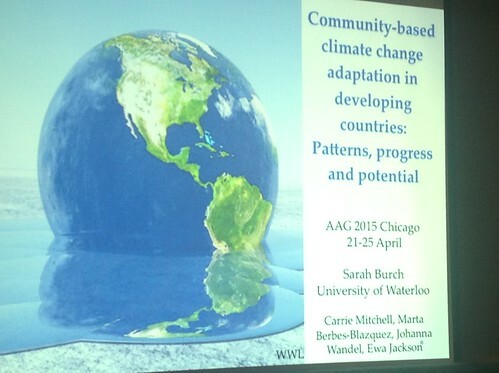 Sarah Burch (University of Waterloo) is also a very good friend of mine and former colleague in graduate school, so it was nice to see some of her post-PhD work in action, on community-based adaptation. I’ve always loved Sarah’s work and it’s nice to maintain the friendship AND the interest in each other’s scholarly work. I also saw work on water and irrigation in Guanajuato, presented by Heather-Lee Brown (PhD student of Wendy Jepson of Texas A&M University, whose research I’ve followed for a long time) and a paper presented by Wendy herself on time and space in water social and geographical research, and attended several sessions where these topics were discussed (technology, time, space, flow). 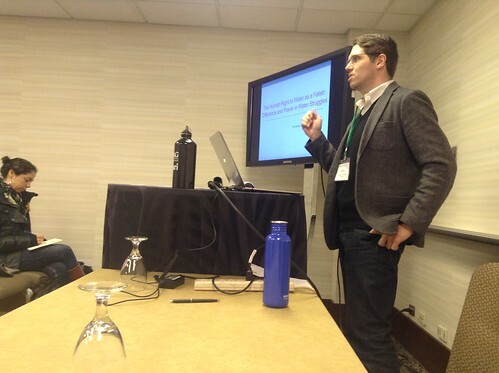 While some stuff did fly over my head because I’m not a social studies of science or science, technology and society studies scholar, overall, I think the water sessions at AAG were fantastic. 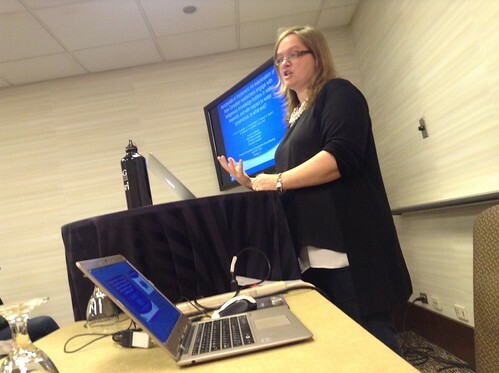 My overall Twitter stream of the conference is available here. My photo set on Flickr is here. And I’ll definitely be back to AAG, that’s for sure. I got to meet many people, see old friends and make new. And my research will definitely move forward thanks to the AAG. I’m really excited for what the next conferences will bring, including CAG. 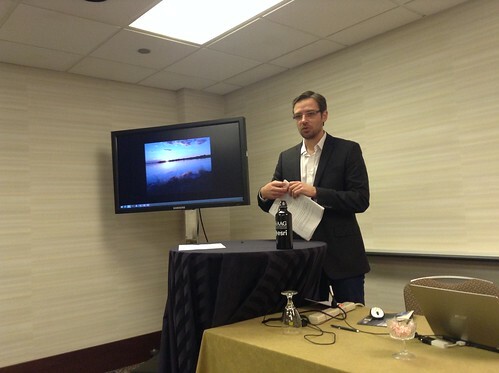 Tagged with AAG, AAG2015, Association of American Geographers, water governance.